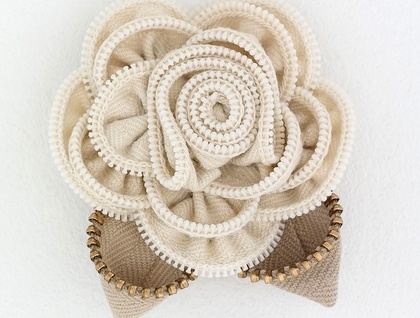 This Vintage cream rose is made from vintage zips carefully hand sewn together to make a beautiful rose. The leaves are made from a complementary beige zip. The gold metal teeth of the zip add a sparkly bejewelled quality. It has a brooch pin on the reverse side so you can pin them to your favourite outfits/hat /bag/coat. A sweet little rose to complement a pretty outfit.